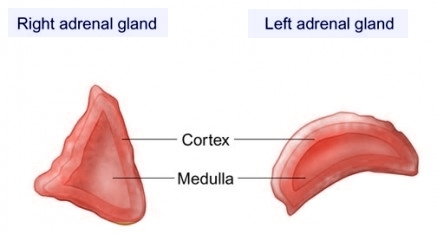 Primary aldosteronism or Conn syndrome is defined as “autonomous,” excessive production of aldosterone by one or both adrenal glands. It is associated with hypertension in the majority of cases and often with hypokalemia and metabolic alkalosis. Hypertension in primary aldosteronism is sometimes difficult to treat. Hypokalemia may be absent in patients with low sodium intake and in those on ACE inhibitor or angiotensin-receptor blocker therapy. The medical history should include a meticulous exploration of prior blood pressure values and changes in serum potassium levels. Hypertension can trigger headache and other symptoms. Chronic hypertension may cause symptoms of end-organ damage, particularly of the eyes, heart, and kidneys. Hypokalemia may be responsible for fatigue, weakness, polyuria, polydipsia, paresthesia, or neuromuscular hyperexcitability (to be differentiated from hyperventilation, hypocalcemia, and hypomagnesemia). Differential Diagnosis. As already mentioned, forms of secondary hyperaldosteronsim are more common than the primary forms. Secondary hyperaldosteronism may be found in patients with hypertension and hypokalemia but characterized by high renin activity, and is often caused by diuretics, oral contraceptives, or renovascular hypertension, etc. • 24-hr urine test for aldosterone and potassium levels (potassium >40 mEq and aldosterone >15 mg). • 24-hr urinary tetrahydroaldosterone (<65 mg/24 hr) and saline infusion test (plasma aldosterone >10 ng/dl) can also be used in ambiguous cases. • The renin-aldosterone stimulation test (posture test) is helpful in differentiating IHA from aldosterone-producing adenoma (APA). Patients with APA have a decrease in aldoste-rone levels at 4 hr, whereas patients with IHA have an increase in their aldosterone levels. • As a screening test for primary aldosteronism, an elevated plasma aldosterone-renin ratio (ARR), drawn randomly from patients on hypertensive drugs, is predictive of primary aldosteronism (positive predictive value 100% in a recent study). ARR is calculated by dividing plasma aldosterone (mg/dl) by plasma renin activity (mg/ml/hour). ARR >100 is considered elevated. ipsilateral venous aldosterone concentration is very high (>1000 ng/dl). • Adrenal CT scans (with 3-mm cuts) may be used to localize neoplasm. • Adrenal scanning with iodocholesterol (NP-59) or 6-beta-iodomethyl-19-norcholesterol after dexametha-sone suppression. The uptake of tracer is increased in those with aldosteronoma and absent in those with idiopathic aldosteronism and adrenal carcinoma. Chronic medical therapy with spironolactone, amiloride, or ACE inhibitors to control blood pressure and hypokalemia is necessary in all patients with bilateral idiopathic hyperaldo-steronism. Unilateral adrenalectomy normalizes hypertension and hypokalemia in 70% of patients with APA after 1 yr. After 5 yr, 50% of patients remain normotensive. If the serum potassium level is persistently low, potassium levels should be obtained from 24-hour urine or fasting spot urine samples. Diuretics should be discontinued for a few days prior to urine collection. In patients with Conn syndrome, hypokalemia is accompanied by hyperkaluria. Complex hormonal testing may not necessarily be required to initiate screening for primary aldosteronism. Diagnosis is confirmed by evidence of elevated plasma or urine aldosterone levels that cannot be suppressed by high sodium intake ( > 200 mmol/day [ > 12 g NaCl/ day]). The diagnosis is also supported by decreased plasma renin activity, which remains suppressed in the upright position and with diuretic therapy. The current standard test is to look for the plasma aldosterone/renin activity ratio, which is quite reliable but also affected by most antihypertensive medications. Therefore, interpretation of results of these tests must take the influence of the antihypertensive therapy into account. For example, beta-blockers decrease, and diuretics increase, renin activity and the active renin levels. Regarding the plasma aldosterone/renin activity (or active renin) ratio, it has to be kept in mind that low levels of renin often are unreliable due to assay-related imprecision for lower range values. Therefore, it may be difficult to differentiate between primary hyperaldosteronism and “low renin hypertension,” especially if plasma aldosterone levels are not clearly elevated. This also explains the variability in the estimated prevalence of mineralocorticoid hypertension, with an observed range from a few permille to several percent.